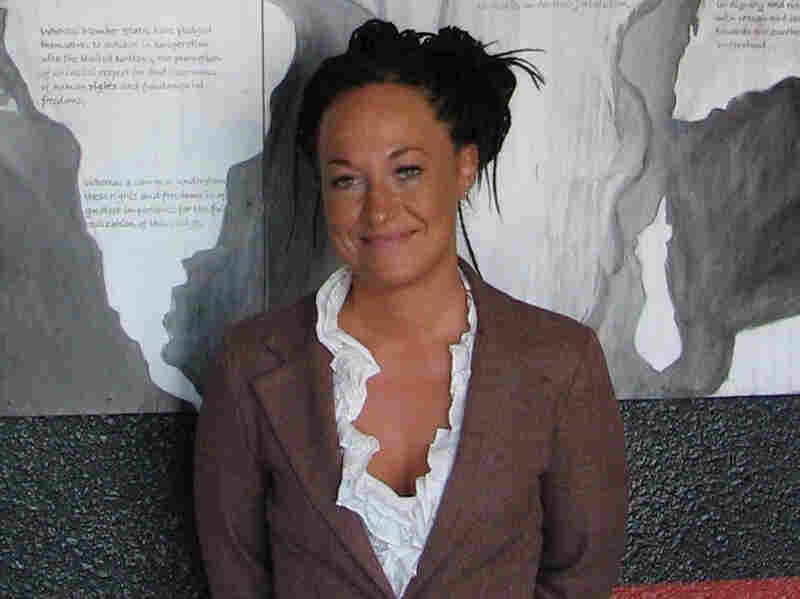 Spokane NAACP Leader's Race Becomes Subject Of Controversy : The Two-Way Rachel Dolezal presented herself as black, white and Native American. But her parents question that, saying she is white. The discrepancy has sparked heated debate. Is the leader of Spokane's chapter of the National Association for the Advancement of Colored People black? Rachel Dolezal stands in front of a mural she painted, in July 2009. That's the question that has roiled the community after a local television station reporter confronted Rachel Dolezal with accusations that she has been misrepresenting herself as being of mixed race, when she is really the daughter of two white parents. KXLY-TV reports that in a picture posted to the Spokane NAACP Facebook page, Dolezal posed with a black man she said was her father. Also, in an application to serve on the city's citizen police ombudsman commission, she listed herself as African-American, Native American and white. The station, however, looked up her birth certificate and found out her legal parents are both white. Earlier photographs shown by the station also seem to show that Dolezal has altered her appearance to look African-American. Dolezal was asked directly if she was African-American. "I don't understand the question. I did tell you [that man in the picture] is my dad," she said, before walking off. The Spokesman-Review reports that the city of Spokane has opened up an inquiry as to whether Dolezal lied on her application. And she told the paper that she owed the local NAACP an explanation before getting into a "broader discussion." "Dolezal's mother, Ruthanne Dolezal, said Thursday by phone from her home in northwestern Montana that she has had no contact with her daughter in years. She said her daughter began to 'disguise herself' in 2006 or 2007, after the family had adopted four African-American children and Rachel Dolezal had shown an interest in portrait art. "Rachel Dolezal dismisses the controversy as little more than an ugly byproduct of contentious litigation between other family members over allegations of past abuse that has divided the family. She's particularly suspicious of the timing, noting that the allegations broke on her son's birthday and come as the Colorado lawsuit filed by her sister against their brother nears a key juncture." Dolezal has become a prominent civil rights leader in the area. She initially came under scrutiny by KXLY-TV after a postal inspector concluded that hate mail left in the local NAACP's post office box was never processed by the postal system. The postal inspector said that the hate mail had to have been placed in the box by someone with a key. Dolezal had a key, but she dismissed accusations that she had placed the mail in the box herself.